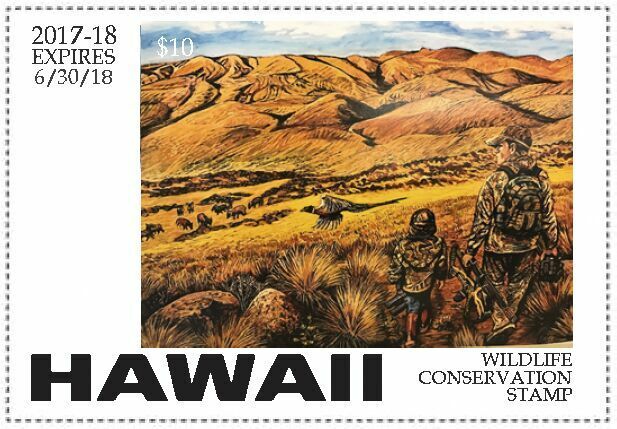 Hawaii Conservation Stamp | The Department of Land and Natural Resources, Division of Forestry and Wildlife has announced the winners of the 2017-18 Hawaii Wildlife Conservation and Game Bird Stamp Art Contest. 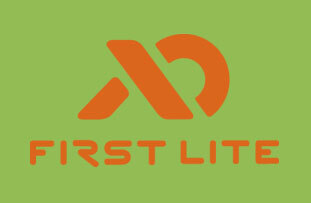 A committee reviewed all submissions and two winners were chosen last month. David K. Hayes, a wildlife artist from Kailua, Oahu, is the game bird stamp winner. Hayes has an art show at the Volcano Art Center titled “Life of the Land” showing until March 26. His winning entry is a painting in acrylic of a ring-neck pheasant in Kohala, depicting a father with his son and daughter bird hunting with dogs. Carol Tredway, a professional wildlife artist from Holualoa, is the Hawaii Conservation Stamp Winner. Her work is displayed at the Glyph Gallery in Holualoa. Tredway’s painting in acrylic depicts a father and daughter bow hunting near Puu Anahulu, with a ring-neck pheasant in the foreground and grazing sheep in the background. These two new conservation and game birds stamps will be available for the new 2017-18 hunting season. The Hawaii conservation stamp is required on the Hawaii State hunting license and the game bird hunting stamp is required for those intending to hunt game birds. Both stamps (differing slightly in text) will be available to wildlife stamp collectors by calling 808-587-0166.